Hamburgers, roast beef, stew, steak, ribs - these mouthwatering dishes all have cows in common. But though beef is enjoyed around the world - from the Argentinian pampas to the kobe beef of Japan - links to obesity and heart disease, mad cow disease and climate change have caused consumers to turn a suspicious eye onto the ubiquitous meat. Arguing that beef farming, cooking and eating is found in virtually every country, Beef delves into the social, cultural and economic factors that have shaped the production and consumption of beef throughout history. 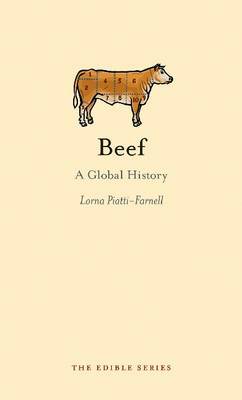 Lorna Piatti-Farnell shows how the class status of beef has changed over time, revealing that the meat that was once the main component in everyday stews is today showcased in elaborate dishes by five-star chefs. Beef explores the place beef has occupied in art, literature and historical cookbooks, while also paying attention to the ethical issues in beef production and contemplating its future. Featuring images of beef in art and cuisine and palate-pleasing recipes from around the world, Beef will appeal to the taste buds of amateur grillers and top chefs alike.